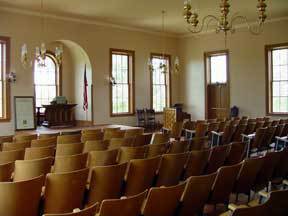 Plan your special event in this historic setting! In 1854 Joseph Goodrich, founder of Milton College and Milton Academy, financed a three story cream city brick building on the campus on the hill. 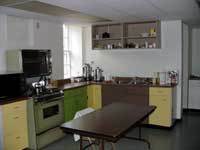 Now lovingly refurbished by former students and maintained by the Milton College Preservation Society, the building is available for rental. Graduation celebrations for that special student make it easier on Mom with the efficient kitchen and no need to worry about the weather. Need a place for a Fundraiser for your organization? Main Hall provides ample space for speakers, musical groups, fashion shows and even theatrical events. Family gatherings for the holidays, birthdays and anniversaries are more enjoyable with Main Hall's lounge and lunch room area. Main Hall is the ideal place for your Business Meeting with large areas for group meetings. Have your lunch catered in the dinning room and network in the lounge area. The former chapel, where hundreds of students started their day for over 125 years now seats 110 people for your event. Huge chandeliers hang from the 16 foot ceilings, while rippled glass windows bring in plenty of natural light. The chapel is air-conditioned for your guest's comfort. Please be aware that alcoholic beverages are not permitted. Main Hall houses the archives and research facilities for the former Milton College. Exhibits of Milton College’s rich history from 1844 to 1982 are available for viewing by the public. Tours may be arranged in conjunction with your event.